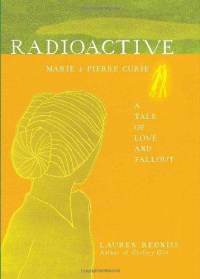 An intriguing mix of art and science, Radioactive is a fascinating biography of Marie Curie, who (along with husband Pierre) was famous for her work on radioactivity. Except this book is much more than a straightforward telling on Curie’s life (interesting though it was) – it also encompasses the history of the atomic and nuclear bombs, the invention of x-rays, women’s role in science, love, revenge and even a few duels. Using a mix of sources and presenting these sources in a variety of ways (photocopies of actual documents, letters, interviews with weapons experts and survivors of bombs etc. ), author Redniss leads us through the life of the Curies and how their research eventually led to horrible events like Hiroshima, Chernobyl and Three-Mile Island. But, as with most things, bad can be balanced with good and their research also led to x-rays (meaning more accurate surgery) and radiation (in the ongoing treatment of cancer) and more effective battlefield medical treatment (through the invention of portable x-ray machines). Redniss used a artistic technique called cyanotype print which is a photographic image created in white on a blue background, which through a mix of sunlight and other chemicals, produces a ghostly, almost ethereal image. Redniss explains in the afterword that she wanted to use this process to reflect the nature of x-rays and it seems very appropriate as you read the book. This was a really interesting reading experience for both the scientist and those of an artistic nature about a brilliant and complicated researcher who changed the world. If you want a straightforward reading experience, this volume is not for you. But if you’re willing to view Curie through an artistic lens and through several layers of time, then you will like this. I am not a scientist in any way, and in fact, know very little about a lot of it, but this info was presented in such a way that even I, the non-science person, found it really interesting. No small achievement, methinks. (She was also awarded two Nobel Peace Prizes in different years for different fields of research. She was the first woman to become a professor at the Sorbonne. Since they knew little about safety concerns with radiation when they were researching, all the Curie’s papers from the 1890s are considered too dangerous to handle. (Even her cookbook is highly radioactive.) Documents are kept in a lead-line box and can only be handled by those wearing protective clothing. 2011 has been declared the Year of Marie Curie by both France and Poland. This entry was posted in Uncategorized and tagged gender roles, medical, Non-fiction, public health, women's history, women. medical by lizipaulk. Bookmark the permalink. I have not read this book, but it does sound interesting. One book I enjoyed about Marie’s life is “Obsessive Genius” by Barbara Goldsmith. Marie Curie was a fascinating woman. Thanks for the review! Oooh. Another title for the list – will look it up and see if the library has it. She was quite an amazing woman.